This workshop is about painting watercolour landscapes on site. There are some wonderful places around Lunenburg, which provide terrific subjects for marine landscapes. Our five days of classes will address the challenges of colour, value and composition while painting outdoors. Classroom time will be devoted to completing work started on site; painting demonstrations and one on one instruction will also be included. No experience is necessary, all levels are welcome. Watercolour brushes: minimum one large wash brush 1” or larger and one round brush #6 or larger. Any other brushes you may already have. Watercolour paper: artist quality if possible, 4 sheets 22” x 30” to cut up. FYI, Tom uses 140lb cold press paper. Watercolour paint: artist quality if possible, one each – red, yellow, blue and dark brown at a minimum. FYI, Tom’s palette includes cadmium yellow, cadmium red, alizarin crimson, ultramarine blue, pthalo blue, cerulean blue, yellow ochre, burnt sienna, burnt umber, paynes grey, sepia, and titanium white. Watercolour palette, water container and easel. OPTIONAL: chair, sunscreen, sponges, paper towel and any mediums such as masking fluid. Be prepared to work outdoors. 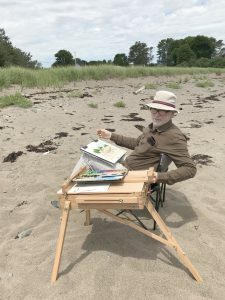 Born in Halifax, Nova Scotia in 1959, Tom studied geology at Dalhousie University and worked for four years in the oceanography department at the university. In 1986, he pursued a combined degree in Fine Arts and Art Education at NSCAD University in Halifax, graduating in 1991. He worked for a year as a teacher. Since 1993 he has been working full-time as a painter in watercolour. Tom’s goal is to paint the light and what that particular light evokes in fact and mood. He is drawn to a consideration of how we mark time in the rhythms of daily rural life and how the cyclical aspect of nature holds a quality of the eternal. He is also drawn by the relationship that exists between the landscape, the ocean and the people. 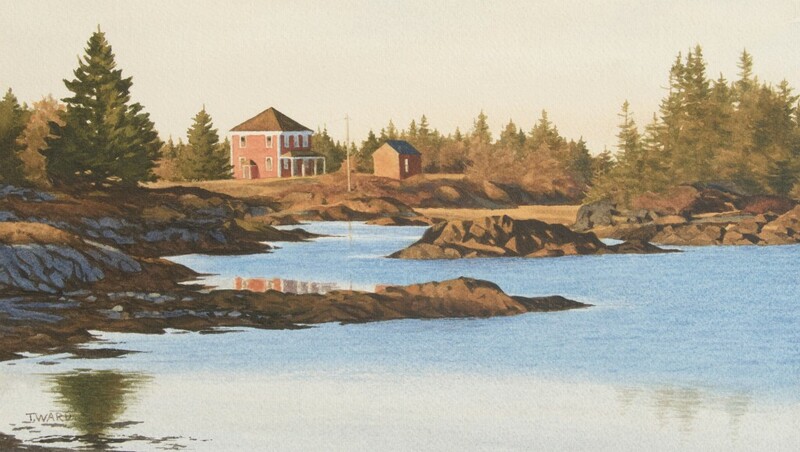 Tom’s paintings may be seen at Peer Gallery in Lunenburg, and are in private collections internationally. His solo shows have sold out on numerous occasions.